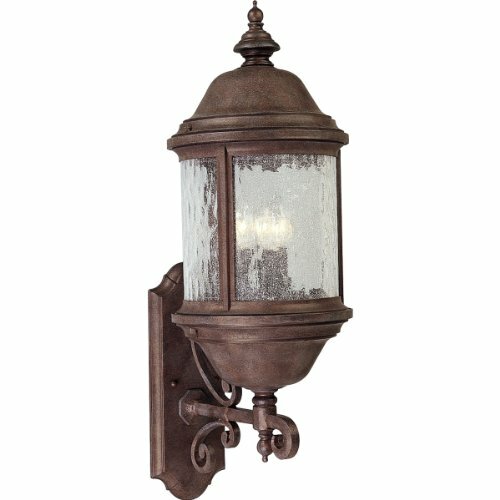 This Ashmore collection lantern features classic, old-world styling and a durable cast aluminum housing. A seeded water glass diffuser works to reduce glare and to minimize cleaning requirements. UV resistant painted finish. Shade Included: TRUE / Room: Outdoor / Warranty: 1 Year. 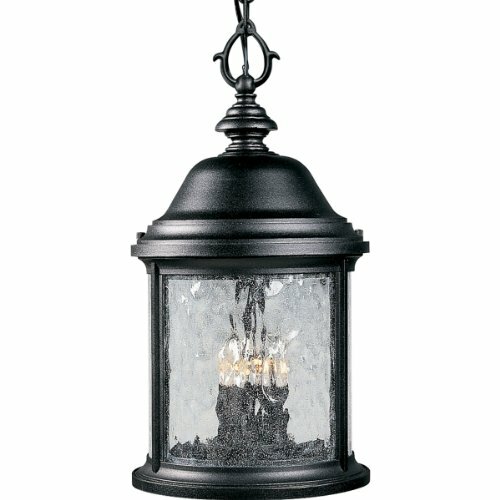 This Ashmore collection lantern features classic, old-world styling and a durable cast aluminum housing. A seeded water glass diffuser works to reduce glare and to minimize cleaning requirements. Fixture is specifically designed for use with energy saving compact fluorescent bulbs. An Energy Star rated bulb is included. 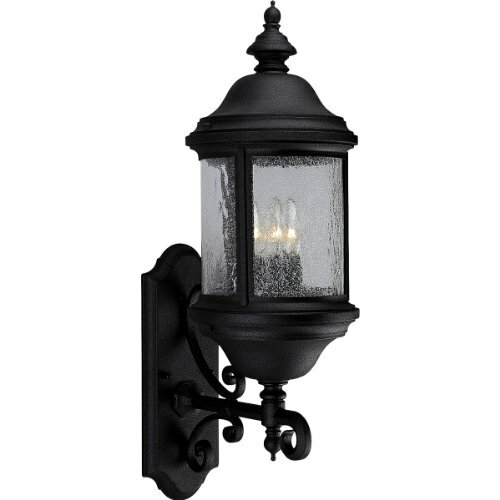 General - Textured Black (-31) and Cobblestone(-33) finishes - Candle covers match fixture finish - Die-cast aluminum construction - Solid brass interior components - Cast wall plate - Water-seeded glass panelsP5649: 4-7/16"W x 5-7/8" ht. P5650: 5-13/16"W x 6-15/16" ht. P5651: 6-3/4" W x 7-11/16" ht. P5652: 15-13/16" W x 6-15/16" ht. P5653: 6-3/4" W x 7-11/16" ht. 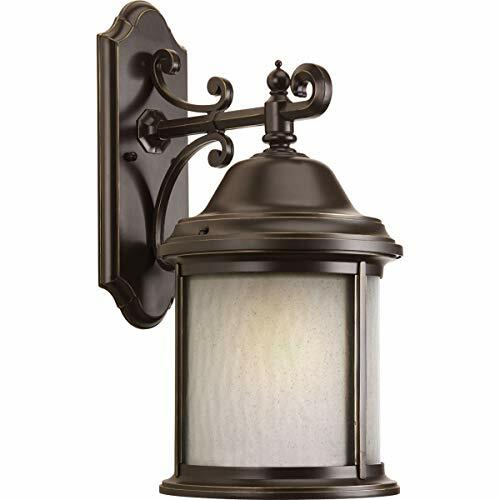 - Each glass panel replaceable - Matching post, chain-hung and ceilingmounted units availableMounting - Wall mount - Covers outlet box - Mounting strap for outlet box and capnuts furnished - P5649 back plate 4-1/2" W. , 9" ht. - P5650 back plate 4-1/2" W. , 9" ht. - P5651 back plate 5" W. , 14" ht. - P5652 back plate 5" W. , 14" ht. - P5653 back plate 5" W. , 14" ht. Electrical - Phenolic candelabra sockets - Pre-wired Shade Included: TRUE / : Duplicate. 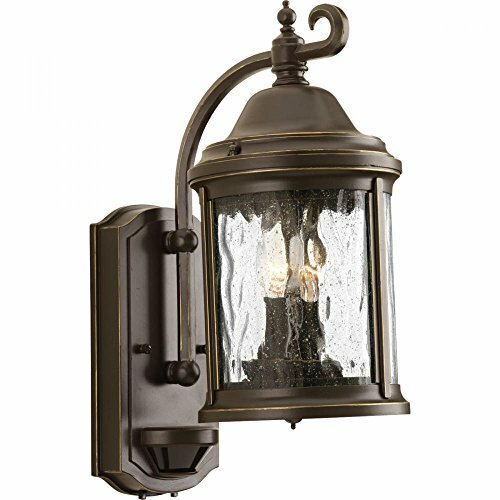 1-Lt. Wall Lantern w/Bulb Water seeded glass curved panels from Progress Lighting offering efficiency, affordability and beauty to any living space. Imagine your life in Progress. P5653-33 Finish: Cobblestone Features: -Solid brass interior components.-Cast wall plate.-Water-seeded glass panels.-Each glass panel replaceable.-Wall mount.-Covers outlet box.-Mounting strap for outlet box and cap nuts furnished.-Phenolic candelabra sockets.-Pre-wired.-UL-CUL wet location listed. Options: -Available in Black or Cobblestone finish. Construction: -Die-cast aluminum construction. Color/Finish: -Candle covers match fixture finish. 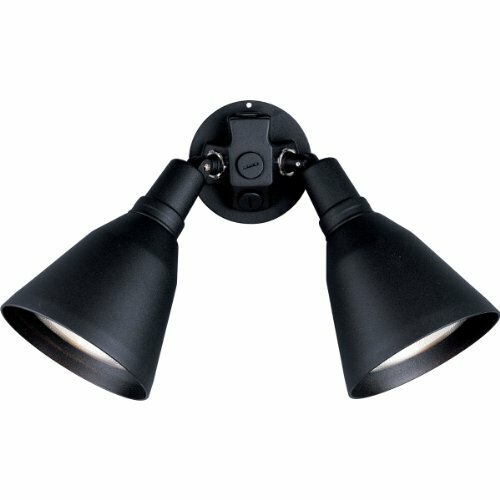 Specifications: -Requires three candelabra base bulbs (each 60w max). Dimensions: -Back plate: 4-1/2'' W, 14'' H.-Overall Dimensions: 28''H x 9 5/8''W x 12 3/4''D. 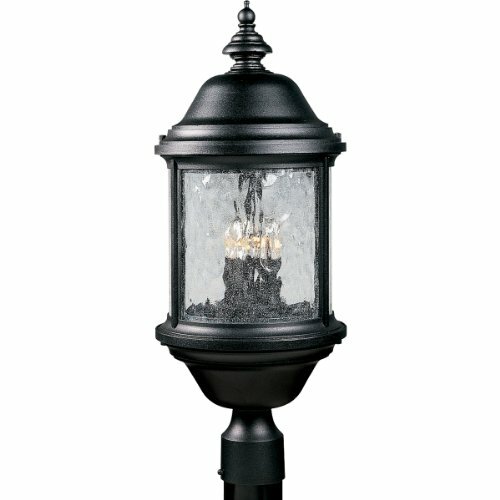 General - Textured Black (-31) and Cobblestone(-33) finishes - Candle covers match fixture finish - Die-cast aluminum construction - Water-seeded glass panels: 7-11/16" ht. ,6-3/4" curved width - Each glass panel replaceable - Matching wall and ceiling mounted unitsavailableMounting - Post top â€" fitter for 3" post or pedestalmountElectrical - Phenolic candelabra sockets Shade Included: TRUE / : Duplicate. 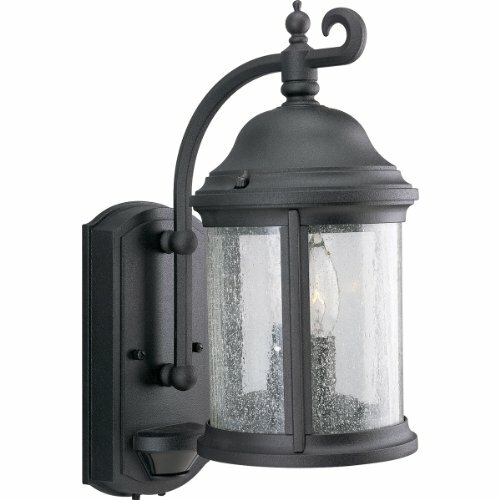 Two-light Ashmore collection wall lantern with motion sensor. 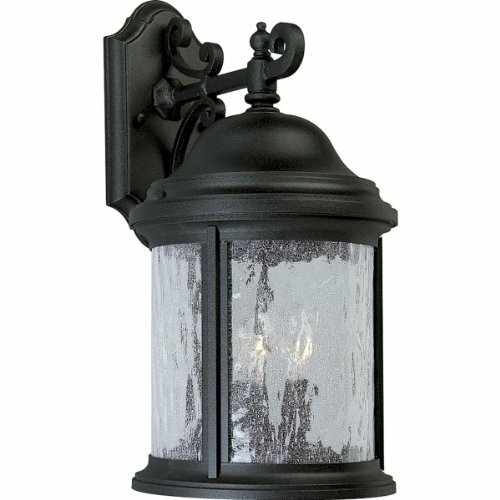 Three-light cast aluminum wall lantern with water-seeded glass. General - Textured Black (-31) and Cobblestone(-33) finishes - Candle covers match fixture finish - Die-cast aluminum construction - Water-seeded glass panels: 6-3/4" width,7-11/16" ht. - Each glass panel replaceable - Matching wall and ceiling mounted unitsavailable - Solid brass interior componentsMounting - Chain hung - 24" steel painted chain - 10 feet of wire - Matching canopy with mounting strap for outlet box - Covers standard outlet box - Canopy 5" dia. Electrical - Phenolic candelabra sockets Shade Included: TRUE / Canopy Diameter: 5.00 / : Duplicate. General - Bronze, White and Black finishes - All aluminum construction - Positive lock swivel- Single stainless steel screw lockMounting - Wall or ceiling mount - Covers outlet box - Stainless screws furnished to mount toears of box - Gasket supplied for back plateElectrical - Medium based sockets- Phenolic with brass screw shellLabeling - UL-CUL wet location listedPhotometrics - Refer to Lamp Application Data for:- PAR20 & PAR16- PAR30- PAR38 Shade Included: TRUE / : Duplicate. 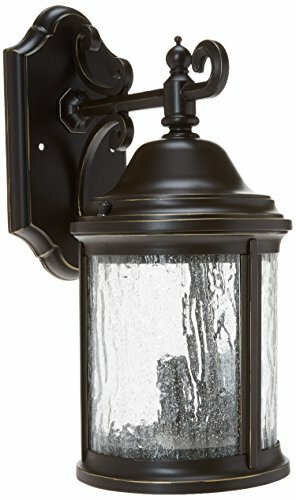 Compare prices on Ashmore Outdoor Wall Lantern at LiveSaler.com – use promo codes and coupons for best offers and deals. We work hard to get you amazing deals and collect all avail hot offers online and represent it in one place for the customers. Now our visitors can leverage benefits of big brands and heavy discounts available for that day and for famous brands. We try to makes comparison shopping easy with Product Reviews, Merchant Ratings, Deal Alerts & Coupons. Find Deals, Compare Prices, Read Reviews & Save Money.